Do you want to make sure that your chimney is securely installed in your home? If so, then you need to give some attention to many of the products that are produced by HomeSaver. 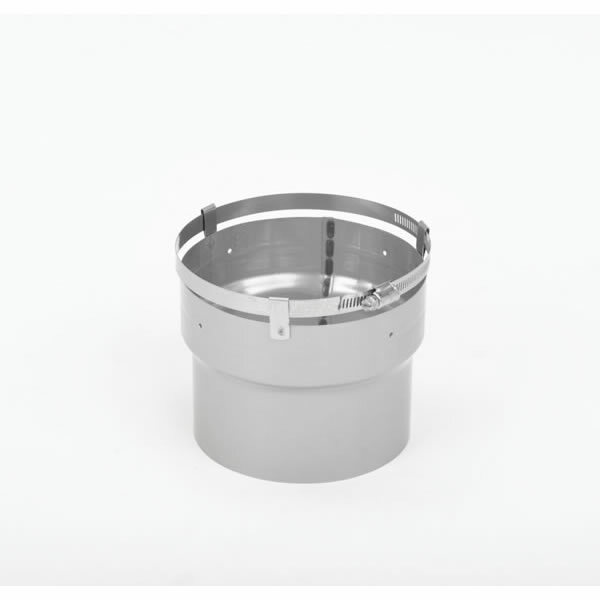 Their UltraPro 6 inch Connector-Adaptor with Band is designed to fully solidify the installation of your chimney, giving to your entire household a product that is both incredibly efficient as well as perfectly posed to provide your home with the necessary heat for a long time to come. Which end of this part goes into my 6"HomeSaver UltraPro chimney liner? The larger end with the band connects to your liner and the other male end would install into the 6" flue collar of a fireplace insert. I will have no clearance after the wood stove insert will be slid into fireplace; can this connector be pre-assembled to the flue pipe and then, sliding in the stove, be installed from inside the firebox by reaching up the flue hole in top, pulling (into place), and then screwed from the inside to hold it secure? Or, is the only way to access the connection from the top of the stove (the only way to properly secure). The height clearance is snug and I don't see a way to connect flue pipe without doing it from inside the fire box. Can you shed some light on this task? Unfortunately, you cannot puncture the inner joints of any pipe. Also, you need to overlap the top of the flue collar for a good seal and you would not be able to do so in the application you have discussed. Not even the seller which I brought my fireplace insert from offered this item. The technical stuff recommended the correct adapter for it. Thank you.